While most computers come equipped with good microphones chances are you have not found much use for yours. QuickVoice changes that by giving you new and exciting voice recording capabilities including: a digital voice recorder, voice emailer, voice stickies creator, and digital stereo recorder. You get several great functions in one low cost software solution! QuickVoice's elegantly designed interfaces facilitate one-click operation for most features such as: recording, playback, voice emaiing and voice stickies creation. Recording is seamless and easy, simply click and speak! Recordings are saved automatically so there's no fussing with folders and filenames. Use QuickVoice to record brief voice notes or for entire lectures and seminars. Recording times are virtually unlimited (except by the size of your hard-drive). You can even use your word processor to take notes while recording. QuickVoice is also ideally suited for recording telephone conversations. QuickVoice is uniquely integrated to work with iTunes (Mac or Windows) or QuickTime. One click automatically converts your recordings to MP3 and adds them to your iTunes library. This is great for archiving or transferring your recordings to digital players such as iPod. QuickVoice is also ideal for digitizing your old vinyl records or cassette collections. QuickVoice has been has been featured by: Apple Computer as an "OS X Hot Pick, MacWorld Magazine as Best Software Under $40, Version Tracker as an Editors Pick , MacUpdate as a Top Pick, and The New York Times (see quote below). QuickVoice is the software your computer's microphone has been waiting for! 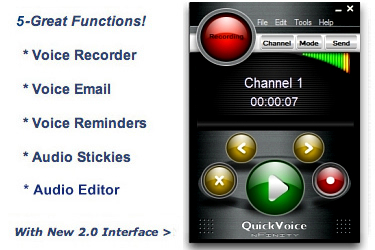 QuickVoice for OSX 2.2.0 - A feature-rich voice recorder with voice email and voice stickies.